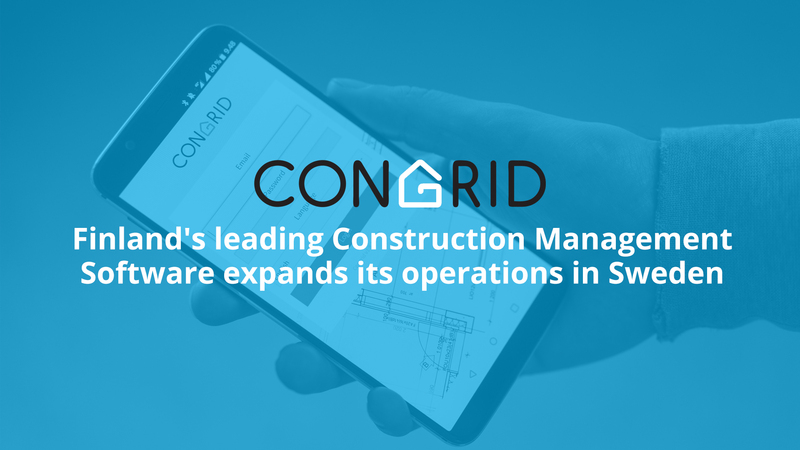 The Finnish construction software company Congrid, which has become the market leader in Finland, is now expanding its operations in Sweden. Congrid has developed a digital platform for management and control of the quality and safety of construction sites, and the platform is already used by all leading construction companies in Finland such as NCC, PEAB and JM. “We have run pilot projects in Sweden for a year and a half, and the feedback is positive. Our digital platform is also ideal for the Swedish market,” comments Timo Makkonen, CEO of Congrid. This year, Congrid will hire more staff to their office in Stockholm and will also attend the Bygg Göteborg 2019 fair, which is held at Åbymässan in Gothenburg between 21-22.3.2019. Congrid was founded six years ago when a couple of young Construction Site Managers became frustrated with the use of pen, paper and Excel-files to control the quality and safety of construction sites. Things should be able to be done better and faster. The Congrid app, which has won numerous awards, grew out of these thoughts. The position of market leader is reinforced by the fact that Congrid not only focuses on high-quality software but also on user support and consultation. “We help our customers every moment. The service experience is the most important to us also in Sweden. We hope that at the Gothenburg fair we can spread the word about Congrid to an ever growing number of Swedish industry professionals, says Antti Vuori, Country Manager.